A sodium/iodide symporter (NIS), also known as a sodium/iodide cotransporter or solute carrier family 5, member 5 (SLC5A5) is a protein that in humans is encoded by the SLC5A5 gene. It is a transmembrane glycoprotein with a molecular weight of 87 kDa and 13 transmembrane domains, which transports two sodium cations (Na+) for each iodide anion (I−) into the cell. NIS mediated uptake of iodide into follicular cells of the thyroid gland is the first step in the synthesis of thyroid hormone. Iodine uptake mediated by thyroid follicular cells from the blood plasma is the first step for the synthesis of thyroid hormones. This ingested iodine is bound to serum proteins, especially to albumins. The rest of the iodine which remains unlinked and free in bloodstream, is removed from the body through urine (the kidney is essential in the removal of iodine from extracellular space). 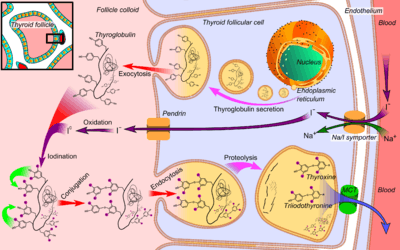 Iodine uptake is a result of an active transport mechanism mediated by the NIS protein, which is found in the basolateral membrane of thyroid follicular cells. As a result of this active transport, iodide concentration inside follicular cells of thyroid tissue is 20 to 50 times higher than in the plasma. The transport of iodide across the cell membrane is driven by the electrochemical gradient of sodium (the intracellular concentration of sodium is approximately 12 mM and extracellular concentration 140 mM). Once inside the follicular cells, the iodide diffuses to the apical membrane, where it is metabolically oxidized through the action of thyroid peroxidase to iodinium (I+) which in turn iodinates tyrosine residues of the thyroglobulin proteins in the follicle colloid. Thus, NIS is essential for the synthesis of thyroid hormones (T3 and T4). Thyroid hormone synthesis, with the Na/I symporter seen at right. Apart from thyroid cells NIS can also be found, although less expressed, in other tissues such as the salivary glands, the gastric mucosa, the kidney, the placenta, the ovaries and the mammary glands during pregnancy and lactation. NIS expression in the mammary glands is quite a relevant fact since the regulation of iodide absorption and its presence in the breast milk is the main source of iodine for a newborn. Note that the regulation of NIS expression in thyroid is done by the thyroid-stimulating hormone (TSH), whereas in breast is done by a combination of three molecules: prolactin, oxytocin and β-estradiol. Some anions like perchlorate, pertechnetate and thiocyanate, can affect iodide capture by competitive inhibition because they can use the symporter when their concentration in plasma is high, even though they have less affinity for NIS than iodide has. Many plant cyanogenic glycosides, which are important pesticides, also act via inhibition of NIS in a large part of animal cells of herbivores and parasites and not in plant cells. The iodine transport mechanisms are closely submitted to the regulation of NIS expression. There are two kinds of regulation on NIS expression: positive and negative regulation. Positive regulation depends on TSH, which acts by transcriptional and posttranslational mechanisms. On the other hand, negative regulation depends on the plasmatic concentrations of iodide. At a transcriptional level, TSH regulates the thyroid's function through cAMP. TSH first binds to its receptors which are joined to G proteins, and then induces the activation of the enzyme adenylate cyclase, which will raise the intracellular levels of cAMP. This can activate the CREB transcription factor (cAMP Response Element-Binding) that will bind to the CRE (cAMP Responsive Element). However, this might not occur and, instead, the increase in cAMP can be followed by PKA (Protein kinase A) activation and, as a result, the activation of the transcription factor Pax8 after phosphorylation. These two transcription factors influence the activity of NUE (NIS Upstream Enhancer), which is essential for initiating transcription of NIS. NUE’s activity depends on 4 relevant sites which have been identified by mutational analysis. The transcriptional factor Pax8 binds in two of these sites. Pax8 mutations lead to a decrease in the transcriptional activity of NUE. Another binding-site is the CRE, where the CREB binds, taking part in NIS transcription. In contrast, growth factors such as IGF-1 and TGF-β (which is induced by the BRAF-V600E oncogene) suppress NIS gene expression, not letting NIS localize in the membrane. The TSH can also regulate the iodide uptake at a posttranslational level, since, if it’s absent, the NIS can be resorted from the basolateral membrane of the cell in to the cytoplasm where it is no longer functional. Therefore, the iodide uptake is reduced. The lack of iodide transport inside follicular cells tends to cause goitres. There are some mutations in the NIS DNA that cause hypothyroidism and thyroid dyshormonogenesis. Moreover, antibodies anti-NIS have been found in thyroid autoimmune diseases. Using RT-PCR tests, it has been proved that there is no expression of NIS in cancer cells (which forms a thyroid carcinoma). Nevertheless, thanks to immunohistochemical techniques it is known that NIS is not functional in these cells, since it is mainly localized in the cytosol, and not in the basolateral membrane. There is also a connection between the V600E mutation of the BRAF oncogene and papillary thyroid cancer that cannot concentrate iodine into its follicular cells. The main goal for the treatment of non-thyroid carcinoma is the research of less aggressive procedures that could also provide less toxicity. One of these therapies is based on transferring NIS in cancer cells of different origin (breast, colon, prostate…) using adenoviruses or retroviruses (viral vectors). This genetic technique is called gene targeting. Once NIS is transferred in these cells, the patient is treated with radioiodine (131I), being the result a low cancer cell survival rate. Therefore, a lot is expected from these therapies. ↑ "Entrez Gene: SLC5A5 solute carrier family 5 (sodium iodide symporter), member 5". ↑ Dai G, Levy O, Carrasco N (February 1996). "Cloning and characterization of the thyroid iodide transporter". Nature. 379 (6564): 458–60. doi:10.1038/379458a0. PMID 8559252. ↑ Smanik PA, Ryu KY, Theil KS, Mazzaferri EL, Jhiang SM (August 1997). "Expression, exon-intron organization, and chromosome mapping of the human sodium iodide symporter". Endocrinology. 138 (8): 3555–8. doi:10.1210/en.138.8.3555. PMID 9231811. 1 2 Dohán O, De la Vieja A, Paroder V, Riedel C, Artani M, Reed M, Ginter CS, Carrasco N (February 2003). "The sodium/iodide Symporter (NIS): characterization, regulation, and medical significance". Endocr. Rev. 24 (1): 48–77. doi:10.1210/er.2001-0029. PMID 12588808. ↑ Ohno M, Zannini M, Levy O, Carrasco N, di Lauro R (March 1999). "The paired-domain transcription factor Pax8 binds to the upstream enhancer of the rat sodium/iodide symporter gene and participates in both thyroid-specific and cyclic-AMP-dependent transcription". Mol. Cell. Biol. 19 (3): 2051–60. PMC 83998 . PMID 10022892. ↑ Riesco-Eizaguirre G, Rodríguez I, De la Vieja A, Costamagna E, Carrasco N, Nistal M, Santisteban P (November 2009). "The BRAFV600E oncogene induces transforming growth factor beta secretion leading to sodium iodide symporter repression and increased malignancy in thyroid cancer". Cancer Res. 69 (21): 8317–25. doi:10.1158/0008-5472.CAN-09-1248. PMID 19861538. Santisteban P. "Mecanismos Moleculares Implicados en la Función Tiroidea: Control de Procesos Fisiológicos y Alteraciones Pathológicas" [Molecular Mechanisms Involved in Thyroid Function: Physiological Process Control and Pathological Alterations] (PDF) (in Spanish). Universidad de Vigo. Retrieved 2011-11-18. Carlos D, Rafael Y, eds. (2007). "Fisiología del tiroides" [Thyroid Physiology]. Tiroides [Thyroid] (in Spanish) (2nd ed.). Aravaca (Madrid): McGRAW-HILL – INTERAMERICANA. pp. 1–30. Jameson JL, Weetman AP (2010). "Disorders of the Thyroid Gland". In Jameson JL. Harrison's Endocrinology. McGraw-Hill Medical. pp. 62–98. ISBN 0-07-174144-5. Fukushima K, Kaneko CR, Fuchs AF (1992). "The neuronal substrate of integration in the oculomotor system". Prog. Neurobiol. 39 (6): 609–39. doi:10.1016/0301-0082(92)90016-8. PMID 1410443. De La Vieja A, Dohan O, Levy O, Carrasco N (2000). "Molecular analysis of the sodium/iodide symporter: impact on thyroid and extrathyroid pathophysiology". Physiol. Rev. 80 (3): 1083–105. PMID 10893432. Dohán O, De la Vieja A, Paroder V, et al. (2003). "The sodium/iodide Symporter (NIS): characterization, regulation, and medical significance". Endocr. Rev. 24 (1): 48–77. doi:10.1210/er.2001-0029. PMID 12588808. Kogai T, Taki K, Brent GA (2007). "Enhancement of sodium/iodide symporter expression in thyroid and breast cancer". Endocr. Relat. Cancer. 13 (3): 797–826. doi:10.1677/erc.1.01143. PMID 16954431. Riesco-Eizaguirre G, Santisteban P (2006). "A perspective view of sodium iodide symporter research and its clinical implications". Eur. J. Endocrinol. 155 (4): 495–512. doi:10.1530/eje.1.02257. PMID 16990649. Libert F, Passage E, Lefort A, et al. (1991). "Localization of human thyrotropin receptor gene to chromosome region 14q3 by in situ hybridization". Cytogenet. Cell Genet. 54 (1-2): 82–3. doi:10.1159/000132964. PMID 2249482. Albero R, Cerdan A, Sanchez Franco F (1988). "Congenital hypothyroidism from complete iodide transport defect: long-term evolution with iodide treatment". Postgraduate Medical Journal. 63 (746): 1043–7. doi:10.1136/pgmj.63.746.1043. PMC 2428598 . PMID 3451231. Couch RM, Dean HJ, Winter JS (1985). "Congenital hypothyroidism caused by defective iodide transport". J. Pediatr. 106 (6): 950–3. doi:10.1016/S0022-3476(85)80249-3. PMID 3998954. Smanik PA, Liu Q, Furminger TL, et al. (1996). "Cloning of the human sodium lodide symporter". Biochem. Biophys. Res. Commun. 226 (2): 339–45. doi:10.1006/bbrc.1996.1358. PMID 8806637. Fujiwara H, Tatsumi K, Miki K, et al. (1997). "Congenital hypothyroidism caused by a mutation in the Na+/I- symporter". Nat. Genet. 16 (2): 124–5. doi:10.1038/ng0697-124. PMID 9171822. Smanik PA, Ryu KY, Theil KS, et al. (1997). "Expression, exon-intron organization, and chromosome mapping of the human sodium iodide symporter". Endocrinology. 138 (8): 3555–8. doi:10.1210/en.138.8.3555. PMID 9231811. Saito T, Endo T, Kawaguchi A, et al. (1997). "Increased expression of the Na+/I- symporter in cultured human thyroid cells exposed to thyrotropin and in Graves' thyroid tissue". J. Clin. Endocrinol. Metab. 82 (10): 3331–6. doi:10.1210/jc.82.10.3331. PMID 9329364. Pohlenz J, Medeiros-Neto G, Gross JL, et al. (1997). "Hypothyroidism in a Brazilian kindred due to iodide trapping defect caused by a homozygous mutation in the sodium/iodide symporter gene". Biochem. Biophys. Res. Commun. 240 (2): 488–91. doi:10.1006/bbrc.1997.7594. PMID 9388506. Matsuda A, Kosugi S (1998). "A homozygous missense mutation of the sodium/iodide symporter gene causing iodide transport defect". J. Clin. Endocrinol. Metab. 82 (12): 3966–71. doi:10.1210/jc.82.12.3966. PMID 9398697. Pohlenz J, Rosenthal IM, Weiss RE, et al. (1998). "Congenital hypothyroidism due to mutations in the sodium/iodide symporter. Identification of a nonsense mutation producing a downstream cryptic 3' splice site". J. Clin. Invest. 101 (5): 1028–35. doi:10.1172/JCI1504. PMC 508654 . PMID 9486973. Venkataraman GM, Yatin M, Ain KB (1998). "Cloning of the human sodium-iodide symporter promoter and characterization in a differentiated human thyroid cell line, KAT-50". Thyroid. 8 (1): 63–9. doi:10.1089/thy.1998.8.63. PMID 9492156. Levy O, Ginter CS, De la Vieja A, et al. (1998). "Identification of a structural requirement for thyroid Na+/I- symporter (NIS) function from analysis of a mutation that causes human congenital hypothyroidism". FEBS Lett. 429 (1): 36–40. doi:10.1016/S0014-5793(98)00522-5. PMID 9657379. Fujiwara H, Tatsumi K, Miki K, et al. (1998). "Recurrent T354P mutation of the Na+/I- symporter in patients with iodide transport defect". J. Clin. Endocrinol. Metab. 83 (8): 2940–3. doi:10.1210/jc.83.8.2940. PMID 9709973. Kosugi S, Inoue S, Matsuda A, Jhiang SM (1998). "Novel, missense and loss-of-function mutations in the sodium/iodide symporter gene causing iodide transport defect in three Japanese patients". J. Clin. Endocrinol. Metab. 83 (9): 3373–6. doi:10.1210/jc.83.9.3365. PMID 9745458. Bowen R (2003-03-10). "The Sodium-Iodide Symporter". Pathophysiology of the Endocrine System. Colorado State University. Retrieved 2008-08-11.